By sticking to those colors, be assured that always have mix and match capability and always look great!.. 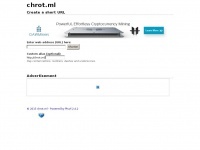 The web server used by Chrot.ml is run by FOP Khodnevych Pavlo Volodumurovuch and located in Ukraine. 16 other websites are located on this web server. Most of them are provided in the russian language. Only a few websites on this web server are x-rated. The websites of Chrot.ml are hosted by a Nginx server and were developed in the programming language PHP. The markup language of the website is XHTML 1.0 Transitional. The website does not specify details about the inclusion of its content in search engines. For this reason the content will be included by search engines.